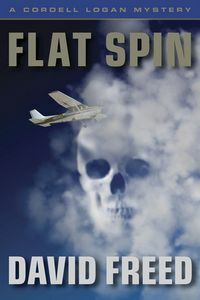 Flat Spin by David Freed: Synopsis and Online Purchase Options. Synopsis (from the publisher): Based in sunny Rancho Bonita — "California's Monaco" as the city's moneyed minions like to call it — Cordell Logan is a literate, sardonic flight instructor and aspiring Buddhist with dwindling savings and a shadowy past. When his beautiful ex-wife, Savannah, shows up out of the blue to tell him that her husband has been murdered in Los Angeles, Logan is quietly pleased. Savannah's late husband, after all, is Arlo Echevarria, the man she left Logan for.